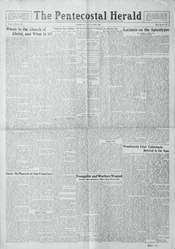 The Pentecostal Herald, founded by Chicago Pentecostal leader George Brinkman in 1915, became one of the most prominent monthly Pentecostal newspapers in the United States. In 1919 Brinkman became the founding secretary of the Pentecostal Assemblies of the U.S.A. (renamed Pentecostal Church of God in 1922) and donated his paper to the new organization. The newspaper was a rich source of theological essays, news articles, missionary letters, and revival reports.